Show off your dog's humor in the fun I Drink Alone Dog Shirt in Black! 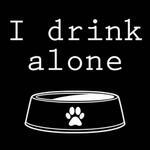 The I Drink Alone Dog Shirt features a dog water bowl and a humorous statement. This dog shirt features a sleeveless style and a high-cut, stay-dry belly for ultimate comfort and convenience. The breathable soft knit is made of 100% cotton. Machine wash, cold and dry flat for best results. 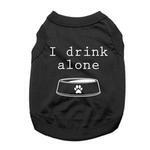 Available in a wide range of sizes to suit most breeds.